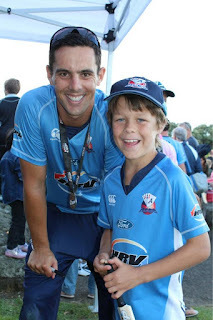 One of the main reasons that the Auckland Aces have been the dominant team in New Zealand limited overs domestic cricket over the last two years is their extraordinary fielding. Guptill, Hira, Vincent and Cachopa have all prowled the infield, cutting off singles and saving boundaries. But there's another element to their fielding that is often ignored. 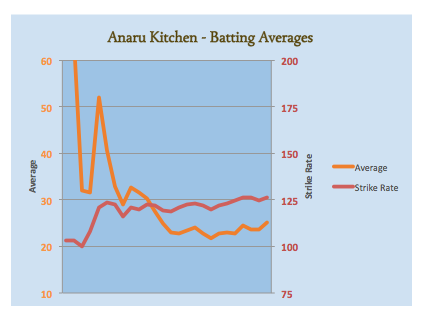 The exceptional boundary fielding and outfield catching of Anaru Kitchen. He is extremely quick, and at times seems to sense where the ball is going before it even leaves the bat. The result is that he has saved a number of runs, and made a significant number of catches for Auckland. He took more catches last season than any of the wicket-keepers. In fact, he took double the number of catches of the most prolific (Kruger van Wyk). Sometimes outfield catching is merely a case of being in the right place at the right time. In Kitchen's case it is more that he covered so much ground, so quickly, that he caught batsmen who thought they had safely hit the ball into a gap. In one game he took a catch at deep backward square leg, while fielding at a wide mid on. To go with his remarkable catching he is also a competent batsman. His career started with a hiss and a roar, scoring 33*, 31, 0, 31, 61* in his first 5 matches, followed by a slump as bowlers figured out where to bowl to him. This often happens to players who have immediate success when they make the step up to the next level. The difference between good players and the rest is how they respond. Kitchen has found a way to score runs, faster and more consistently after his lean patch. His career strike rate has risen above 125 and his average is now over 25 (as shown in the graph below. He still has some work to go before his batting alone would be a reason to select him, but when combined his fielding prowess, it resulted in his being named in the 30 man New Zealand training squad for World T20. Anaru Kitchen is someone to keep an eye on in the Champions League T20, both with the bat and in the outfield. These player profiles are incredibly interesting. If you ever get put in charge of an IPL franchise then I have no doubt you'd be able to put together the cheapest and most effective squad. Thanks Alex. :) - I think if I was to put together an IPL team they would probably be a motley collection of unfashionable players who regularly lost in unexpectedly tight matches. I do actually really enjoy putting together the player profiles. It has actually been a while now since I actually wrote a stats piece, but these have been quite a fun diversion.